For the first two years of it’s genre, the Ricoh GRD, GX100, and Canon G7 were the top compact cameras in the marketplace. This has changed as camera companies have realized that yes, photographers do want high quality image making ability in the palms of their hands. Currently, the high quality compact camera field includes the Ricoh GX200, Ricoh GRD (II), the Canon G10, the Nikon P6000, and the Panasonic LX3 (we’ll ignore the Leica clone model). Ah, and the Sigma DP1. Many reviews are out on these tools, but I have a will to be weird, so when Matt emails me and says we should test out his new LX3 in my new home studio, I says “Hell Yes” in my heads. Matt picked up the Panasonic LX3 for an upcoming bike tour in Asia, I just got a studio background system, Matt has a set of Elinchrom Ranger Rx flashes, and I have a new coffee pot and set of vintage coffee cups. The keen reader might be able to guess what’s coming next, but I’m about to tell you so it’s irrelevant. 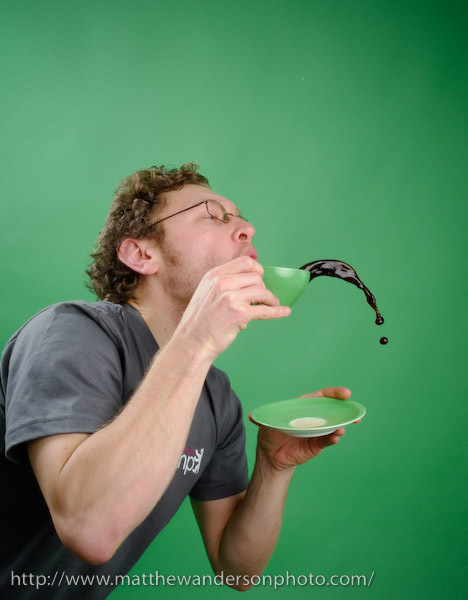 There’s a shot I’ve been replaying in my head for a while, a person trying to sip a bit of coffee as it flies through the air, just out of reach of their lips. This is easy to imagine, but slightly more complicated to realize. 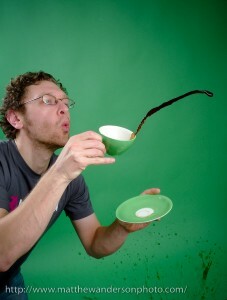 You need good lighting, a fast shutter speed to capture the coffee in the air (with tack sharpness) and you need a place to do it. With Matt’s email, I knew all the elements were now in place. Now, we had other tools to do this shot, I have a Minolta 7D, Matt shoots his professional jobs with a Nikon D300, and we both have access to excellent rental shops in Zurich, where you can get whatever you need from Canon to Mamiya, from Leaf to Phase One. But we wanted to explore the LX3 and see how it works in the studio. 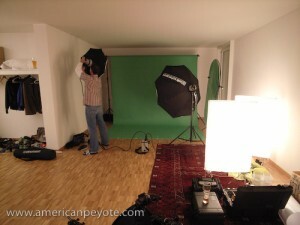 Does it make sense to use a $2000 lighting kit with a pocket camera? Hell Yes I says in my heads. The Elinchrom Ranger system was fired using the Skyport radio trigger system, as the LX3 has a hot shoe, this worked flawlessly. The Ranger RX system has a flash duration around 1/2250 sec. depending on the power setting (according to the Elinchrom specs). This is one reason to use a top-of-the-line lighting kit like the Ranger system over my Strobist-inspired Contax and Metz flashes for capturing coffee in the air. With such a short flash duration, you can freeze moving liquids with super precision. Additionally, we used Matt’s Elinchrom Octa box, which provided beautiful wrap-around lighting – and makes my small Alzo softboxes look like, well, small, inadequate light modifiers (for this application). 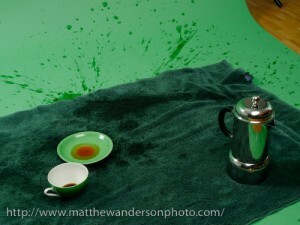 The full setup included an Apple Green background, and me kneeling on the floor with a few towels laid down to protect the paper from the incoming coffee splatter (only partially effective). 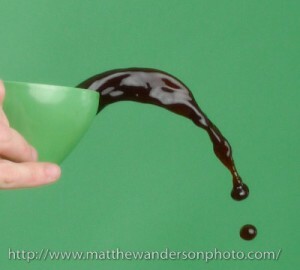 We had a system, Matt counted one….two….three, and at each number I moved….left…..right…..left, and at the same time propelled the coffee cup in the air and tried to catch the flying liquid with my lips. Then I would wipe up all the coffee splatter that missed the towels and had landed instead on my new wood floor. This took a few shots to get the timing down, but after a few tries and two beers we were getting acceptable results. One main difference between DSLRs and compacts is shutter lag and focusing time. To get around these limitations Matt pre-focused and locked the focus on his LX3. This essentially eliminated the shutter lag problem. He shot with a shutter speed of 1/1000 and an f-stop of f/8. There were no problems syncing the flashes at this speed, the Skyport system worked much better than my Chinese radio triggers in this regard (high speed syncing). This of course highlights one reason to use the LX3 instead of a DSLR or a digital back system, theoretical high-speed syncing on the order of 1/2000. Chase Jarvis did something similar in his Kung Fu water droplet tutorial. But you really don’t need a $40,000 camera system to capture liquid in the air. In fact, you’re a tad limited if you do pick the Hasselblad because if you use a $40,000 Hassy system you’re limited by the sync speed of the camera. To work around the shutter sync limitation one would generally decrease the ambient lighting in the studio, open up the shutter of the camera, and then fire the strobes separately to capture the action, and close the shutter. The exposure is then determined by the flash exposure and aperture setting of the lens. This technique requires a bit of preparation for each shot. With the LX3 and it’s high-speed sync abilities combined with short duration Elinchrom strobes, you just point and shoot, which is the whole point in using a point-and-shoot camera. ?You’ll need to fiddle a bit with the strobe power setting and aperture setting on the camera, but it only takes a few seconds. ?In this setting the shutter speed was around 1/600, but a lower speed could have been used as well, the exposure of the scene being dominated by the strobes. The combination of studio lighting and the LX3 really surpassed what I was expecting. The light quality produced with the Octabox combined with the short flash duration of the Rangers made it possible to freeze the flying coffee with a texture and definition I was not expecting. When combined with the resolution of the LX3, and it’s superb Leica lens, you get a tack-sharp image with excellent color and dimension. The combination of a small sensor camera with a small aperture also meant sharpness across the image. As the LX3 RAW format is not widely supported, Matt shot in JPEG, which was fine for this application. We’re not planning on blowing these images up to large sizes and the exposure was perfect, so the difference between a RAW and JPEG image in this shoot was fairly minimal. There’s one thing I’ve learned since I started shooting with a Ricoh GRD a year ago, and is reinforced here: pocket cameras, like all tools have limitations, but when the right light is used, the resulting images can be as jaw dropping as those taken with DSLRs. Lighting and composition are generally more important than megapixels, and it’s one reason why I’ve added more flashes and modifiers to my toolbox instead of a new DSLR (but the Sony A900 is oh, so, so tempting). Still, if you’re getting a pocket camera, it’s good to know it can be used in a variety of situations. Like the Ricoh GRD, the Panasonic LX3 works great in the studio environment. When Matt emailed me about shooting with the LX3 in the studio I was afraid I would be motivated to pick up an LX3, but the experience was worse, because now my eyes are set on the new BXri 250/500 Elinchrom flashes announced at Photokina. Matthew Anderson recently moved to Switzerland and is currently engaged in the art of producing beautiful wedding photography and the precision of imagery for commercial clients. I technically didn’t do much photography here, and was more of an art director, have little of a life and fill the void with photo gear.